Britain's economic austerity induced rioting, looting and arson has begun by dispossessed benefits culture youth with little prospects of jobs fuelled by spending cuts of youth services of as much as 75% and few of whom had considered further education now being saddled with a lifetime of debt should they go to university, the trigger for which was the apparent dubious shooting on Thursday night of an Afro-carribean male by police in Tottenham (London) under the Operation Trident which targets black on black gun crime, though the social tinder box was awaiting a trigger so sooner or later it would have been ignited by any excuse for rampant destruction and looting of high streets starting in Tottenham on Saturday, but soon spreading across London as rioters and looters took advantage of an increasingly thinly spread police force via social media sites such as Twitter and Facebook, utilising smartphone's such as Blackberries to quickly organise and target lightly policed high streets much as protestors in the middle east used social media sites and mobile phones to quickly organise. Mobs of rioting rampaging youths who are now nothing more than common criminals are not only destroying peoples homes and livelihoods but also ensure that their local black / ethnic / deprived economies are set to take a further economic nose dive far worse than anything that economic austerity would have delivered, as house prices are set to crash as buyers evaporate, many businesses will be unable to trade under extreme conditions with risks of loss of property or life resulting in temporary closures for many and permanent for many of those that have been actually attacked, with resulting loss of economic activity. Longer term many existing businesses will seek to move out of area's affected including more affluent areas targeting by looters and new businesses will scrap plans for investment. 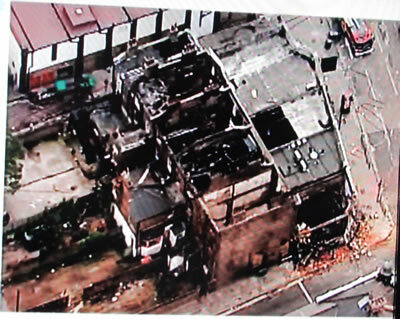 As occurred following the rioting of the early 1980's the consequences of what is taking place today will impact on the areas affected for many years if not decades. Rioting overnight has spread across London to now include Tottenham, Enfield, Hackney, Peckham, Croydon, Ealing, Hammersmith, Clapham, Bethnal Green, Lewisham, Woolwich, Camden. 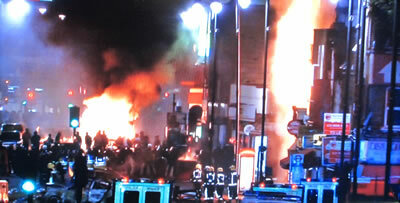 As occurred during the 1980's the rioting is now spreading across Britain's inner cities with disturbances during the night taking place in Birmingham, Bristol and Liverpool. However unlike the early 1980's, Britain has become the CCTV capital of the world with more cameras than totalitarian states which ensures that the vast majority of the rioters, looters and arsonists will be be tracked down and brought to justice, which is small comfort to those that are losing everything during each nights rampage. Many of London's deprived inner city areas were banking on the 2012 Olympics tourist boom to boost their local economies, who will now think twice to avoid riot hit areas. Whilst the current build up in social pressure may have been as a consequence of implemented austerity cuts, however the underlying cause is Britians Benefit's Culture which results in those able to work instead spending a lifetime on benefits, with their children growing up to follow their parents and grand parents example into a life also on benefits, unable to afford what others in work can, with building resentment towards society that is primed to eventually explode. Whilst the number of rioters may number in the low thousands unfortunately as earlier analysis has repeatedly revealed the benefits culture extends to over 8 million people of which upto 3 million on top of the official 2.5 million can work but choose not to work therefore boosting Britains true unemployment rate to about 5.5 million. The solution is for Britain to go through the painful process of dismantling the welfare state benefits culture, to force those able to work into work, so that they can progress in careers rather than bitterly stare on at others as life passes them by, being tempted into periodic acts of violence and law breaking as we are witnessing today. It truly is ironic how those that work hard either through employment or by running small business are forced to fund the life style of lazy benefits youth who follow their parents example into a lifetime on benefits, who instead of thanking their benefactors are instead engaged in acts of wanton violence, and destruction of property and livelihoods. But as mentioned earlier, the perpetrators will not escape justice, watch for their faces to be plastered over the mainstream press over the coming weeks. Forcing people who can work to work is no doubt correct, but the problem is deeper than that. Culture trumps economics. Multiculturalism is no-culture-ism, which means no civilization. You can spend all the money on education you want and have the most rational programs, but if the basic quality of the people is not there anymore, it's all useless. You can't make a silk purse out of a sows ear. People need to face up to the fact that "Britain for the Britons" is actually a good and necessary solution, as is "America for the Americans". Having nations is a good thing. 09 Aug 11, 08:58 America for American's? Hmm, does that mean the europeans and their decendents need to leave America ? No, it doesn't. You are apparently not familiar with America. It means that the assurance that came with the Ted Kennedy/Javits immigration bill of the 60's that American cultural integrity be maintained be honored. As is, over 90% of immigration, both legal and illegal, is non-European, whereas American culture was overwhelmingly European. It means that my hometown of 20 thousand, which was a nice American place to live until the papa Bush amnesty, and is now half illegal-Mexico and a shithole, be somewhat returned to America. Another good thing it might mean is doing away with dual citizenship. You can't be loyal to two countries. Under the diktats of the NWO Americans are now 2nd class citizens, at the back of the line for everything, especially jobs, in their own country, as are Europeans in Europe. Diversity is strength? No it's not; multiculturalism is cultural disintegration and weakness. The point of my remark, that culture trumps economics, I stand with. Your article indicated the British riots are just an economic issue with economic solutions; I suggest otherwise. It maybe painful to hear, but there is only one race, and that is african, were all africans. We have the situation in te US where a mom has to travel 2 housr each way to work for minimum minus wage, whilst another person is employed to look after her kids? Also, what if your pay doesn't pay for your basic living costs? We have mega corporations here in the UK that make mega profits yet pay their staff minimum wage knowing full well that the government will be forced to subsidise their paltry pay. (It is a system well known in the UK from old called "speenhamland", and it stinks). Wouldn't you say that if a business can only thrive by getting what is in effect subsidised labour then that company is not really a "going concern". It is well understood with modern research that we all emanate from "Africa" - of course nobody called it "Africa" then! The minor visual differences between the Homo sapiens that occupy this little blue planet are nothing more than local adaptations – including of course the pale (white) skin colour. A society is only as healthy & free as the level of responsibility assumed by the average individual in that society!. You can thank the overgrown UK State tentacles for the root cause of the riots, because it has over the decades sequestered much of the financial & social responsibility away from the individual – resulting in a a large welfare state. Now the average level of social/financial responsibility exercised by an average individual is so low that these kind of outbursts are a natural in such an evironment. Nadeem is correct in suggesting the disamntling of the welfare system and handing back financail and social reaponsibilites to the individual where they belong! It is too late to blame bad parenting and any other surface symptoms – when the root cause is firmly in the hands of the state. Could you imagine a similar riots taking place in a place such as Hong Kong? It is a worrying time for Britons, who have seen a riot in Tottenham escalate to widespread unrest across the city and beyond within 72 hours: looting, attacks on police, the burning of cars, businesses and residential properties. We are more used to seeing burnt out cars on our TV screens on the streets of Baghdad, Mogadishu or Karachi than we are in London. So it’s a deep humiliation for the UK which is a country without the depth of problems affecting those other places. It is hardly surprising that people are speculating about the causes of this unrest and outbreak of criminality. The rapidly infectious nature of this gross unrest suggests it is not simply related to the shooting by police of a suspect last Thursday. It will be days or weeks before the inquiries are set up, and months or years before they report their findings. 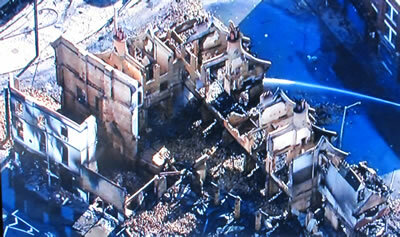 Until then, people will speculate as to the causes. Whether or not Mark Duggan was killed by police because he was an imminent threat to anyone, may or may not emerge. Whether or not the peaceful protest was mishandled by the police will be a matter of opinion. Similarly, legitimate questions will be asked about the closure of youth clubs and youth projects in response to the government’s debt situation; and the levels of youth unemployment. Are these rioting youths, who will likely pay heavily for their crimes if they are caught on CCTV, victims of the bankers? Maybe, or maybe not. Many will doubtless speculate on these things. But whatever the speculation, these images will make middle England think long and hard about how detached they are from the section of society that is engaged in criminal violence. The statements of politicians, that such violence is ‘unacceptable’, look at best a statement of the obvious, and at worst a proof that they had no idea that things were this bad in their own country. Just as with Anders Behrling Breivik, and Lehman Brothers & Northern Rock, they had NO IDEA it was coming. Almost all talk about social cohesion in the past 10 years has settled on the immigrant community, and how little they have assimilated into society – to the exclusion of all other problems. Britain, like other western countries, has faultlines based on race, religion, age, and urban liberals versus ‘middle Englanders’ [not nearly as exaggerated as the liberal - conservative split in the USA, which is characterised by vehement mutual hatred]. The current situation should seriously make us realise how much the rioting youth have in common with the suburban majority watching in horror. This is as large an example of a lack of social cohesion as one could ever expect to see. This group have been failed by state, society and system for generations; and this neglect has been exaggerated by politicians and some commentators manufacturing the case that the immigrant community is the obstacle to social harmony in society. Those who deflected all attention on to immigrants must share some of the blame for what is happening today. Whenever people address anti-social behaviour and the growing lack of respect in society [and what we are seeing is the same thing, but on a colossal scale] they do not seriously address why these attitudes have worsened over decades. The discussion usually stops at how the system encouraged wealth inequalities. Some will realise that the credit crunch has come home to bite, and exposes the cracks in ‘Broken Britain’. But very rarely do we have an honest discussion on how liberal values have contributed to the breakdown of family life; and how the breakdown of families has contributed to a couple of generations of young people becoming disconnected from ethical and moral values that their grandparents collectively held in the post war period. Commentators will blame the individuals – the absent fathers, the single mothers – but never the system that institutionalised these problems over generations. The values of individualism, lack of respect and absence of any sense of ultimate accountability - these are too fundamental and deeply troubling for policy makers in the West to address. But unless someone raises these questions, and forces society to look at its own weaknesses, there is no hope that it will come to any sense of understanding as to why hundreds of its young people will go to prison, having harmed properties and lives, for no reason except frustration, exclusion and in a few disturbing cases, because they actually enjoyed it! Breakdown of family life, as people had to prioritise work, and the pursuit of money, over the ties of family and community. Rampant individualism, such that people think of themselves and not others. A society that feels free to insult and disrespect the sacred, will eventually and inevitably disrespect itself. Much has been said about Britain’s ‘Broken Society’. Solutions have been around reforming the benefits system, trying to encourage people back to work and off benefits – as if this is the sole cause of the problem. Even if the argument of social deprivation is entertained it speaks volumes that the down trodden must burn half their own high street to make their voices heard. No, I don't think such criminal riots would happen in Hong Kong, China, Japan, where they have a strong culture and high quality people. Do you think China and Japan have low criminality because the state is weak? I agree, foster individual initiative and responsibility, make people work, but there are limits to what you can do with economic devices. The "we're all Africans"argument is politically correct claptrap. Ask Chinese anthropologists; they don't buy it. It has about as much validity as saying all dogs are the same because they came from wolves. Your confusing the state with the welfare state. Yes I agree we should become more asian in the size and scope of the welfare state, the nanny state is no good, it is uncompetitive in every respect creating vaste pools of untilised labour that breeds feral youths. Infact the benefits culture is ultimately doomed, because the name of the game is to produce more babies to maximise benefits which the parents do cannot and do not look after and so the cycle repeates each generation against which the workers and middle classes cannot compete because they are limited to the number of babies they can have and thus a benefits culture society such as Britain's will ultimately collapse under the weight of an ever expanding benefits bill. Luckily the cycle can be broken because at the end of the day, children are a blank slate and can be taught to become productive members of society. The Chinese anthropologists are wrong. They may fanticise about being a different species of human but they are wrong. The last one died out about 30,000 years ago (Neanderthals), could not compete with modern man since we are the ultimate killing machine against which nothing else can compete, even our closest cousins (Neanderthals) did not stand a chance once they met up with the African's, though there may be some Neanderthan DNA in us all. Perhaps when people start playing with the human geno then there will be a significant difference between modern humans, until then we are all the same, no difference whatsoever. Those that believe so are delusional as were the Nazi's and Japanese. Get your DNA analysed then you will know the truth about your ancestory which is probably more black than you can possibly imagine! Nadeem- Thank you! I love your pulse on the markets . I also remind you that over a year ago you said in an article that the only way out of the mess is austerity or inflation. You correctly said that austerity, although often needed, leads to riots and social unrest. 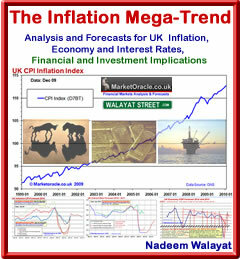 You have continued to tell us that inflation is just stealth defaulting. I would add it perhaps has the advantage of avoiding the riots but not sure (truly) in the big picture which one wins the day. I'm ok without the riots,but not sure how we'll handle inflation. In any case, listen Ernie - my kids are African, I'm not from the USA myself but we all live here. We, as ome family, have created three jobs in the last six months - for Americans. So we are contributing- ok? My neighbors are Mexican and work like dogs so you can have cheap lettuce. Stop the denegration of race and start thanking contributing members of society no matter where they hail from. This is all mixed up and typical. If one defends nationhood and culture one is branded a racist, though not having brought up race at all. Only 3% of the illegals in the USA are in agriculture, over a third are on welfare. Coalescing third world corrupt Mexico with the USA is bad for most Americans and benefits only the rich. Statistically globalism and multiculturalism are failures. Look for continuing riots, destruction, and social and economic degradation in the UK. More conservative economic policies are not going to make any significant difference. 10 Aug 11, 10:32 not in Hong Kong? Enough said, need to go back to make money. P.S. Nadeem, thanks for all the effort. I look forward to reading more of your articles. I don't necessary agree with all of your statements. But your work continuously giving me fresh perspectives. In case you visit HK, hope can buy you a beer and will show you where we can buy real gold (not paper gold) from most banks and jewellery stores on the street. There are similarities between the rioters and the bankers reeking havoc on their respective markets – which therefore points to a more fundamental, underlying cause. Whether it’s the latest iphone or the next Porche – pure material greed motivated both the rioters and the bankers. The devastation of the rioters just like the bankers spread from one market, one town centre to the next causing millions and billions of economic damage in its wake. Mob rule took over as the markets were attacked in waves by rioting gangs and bankers on mass as soon they felt the vulnerability and weakness in their victims. Common accounts of rioters and bankers getting pleasure from the exhilaration of pushing the limits and going to the extreme. The rioters and bankers both showed utter contempt of society and the impact and consequences of their actions on individuals, families or communities. 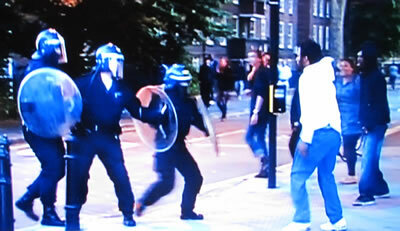 The Metropolitan Police failed to control the rioters just as the Bank of England, Financial Services Authority and the UK Treasury were unable to regulate the bankers. The above similarities cut across racial and class boundaries between the rioters and the bankers and illustrates something more deeper underlying the cause of the riots of today and the havoc reeked during the financial crisis of 2008/09. This deeper underlying cause is the fundamental values founded on individualism and materialism which then “governs” the behaviour of all those who adopt it resulting in the mayhem we’ve seen which seem worlds apart but are more similar than we care to accept. What do you think statements of "quality of people" implies, if not race? The primary reason why youth are rioting and stealing is the benefits and consumer culture, that has created a bunch of lazy louts that want instant gratification without having to work for it, because they get everything for free, in their mind they percieve that society owes them something which if not given will take (steal). The solution is simple, to cut the welfare dependancy state, so that people become responsbile for themselves, which is how it is in countries such as China, where you don't have a large welfare state instead people know if they don't work then they don't eat! Race has absolutely nothing to do with it, it is this b@KJstard welfare state, that lets fathers evade their responsbility to look after their children, mothers turning into baby making factories to maximise benefits claimed. These neglected children growing up without fathers and mothers that don't care are never taught the work ethic hence demand everything for free without work! THAT IS the reason for the looting masquerading as rioting! You've made a very good point. The news coming out suggests that alot of these people are not on benefits. You have a teaching assistant and a kid from a posh grammer school amongst others. Bankers and Rioters share similarities. It would seem that excessive individulism and materialism is to blame. We did not just get here overnight. It's been going on for decades i.e. decay of the social fabric of this society by values based upon individulism/materialism. "force those able to work into work"
What would you have them do? and at what wage? I agree that everyone needs to work, but here in the USA we have exported all of the blue collar jobs to Mexico, China, etc., there are simply not enough jobs for everyone...and the bulk of the jobs available pay "survival" wages. The USA isn't burning (yet) because the "safety net" is fully funded. Also, we're heavily armed....there would be no rampaging youth in my area town...if they tried it, there would be a lot of dead bodies inside and in front of the stores they intended to loot. "The solution is simple, to cut the welfare dependancy state, so that people become responsbile for themselves, which is how it is in countries such as China, where you don't have a large welfare state instead people know if they don't work then they don't eat!" That works in China, but not in the UK. No one starts at the top, everyone works their way up from the bottom, benefits destroys the incentive to work which results in wasted lives that is no good for those on benefits or society. Look, someone who has spent their whole life on benefits by age 50 will say what ? That they have wasted their life. Britain's benefits system is all screwed up, it allows for generations to spend their lives on benefits, this needs to change else we will ultimately end up where china is in terms of ultimate response to ramaging youths, perhaps not today but fast forward a few years or decades of similar trend to what we are witnessing today. The out of control welfare state benefits madness needs to end! "No one starts at the top, everyone works their way up from the bottom"
With a little reflection and fact checking, you'll find that this statement is patently untrue, Nadeem. The main way people attain wealth in the USA is still the old fashioned way: they inherit it! How 'bout Charlie and his mom, the richest woman in the world? How 'bout "W", the addlepated wastrel numbskull, born on third base with a silver spoon in his mouth? Worked his way up to the top? There is rottenness and injustice at the top and at the bottom. The most horrendously unjust welfare entitlements are those given to the filthy rich bankers. But still, you're right, a welfare/benefits culture that does not require people to work is dysfunctional. Balance is needed in working toward a just, dynamic society. The culture and human material you are working with are fundamental. Hard work as a cultural value is indispensable. So is an inherently decent, intelligent, non-criminal populace. How about requiring that immigrants of whatever background, be high quality people, mainly that they be intelligent? Another taboo area? Too politically incorrect to address the issue of human quality? How about deporting criminals and those who refuse to work? Why are the Scandinavian countries, Denmark, for instance, so rich and successful while having a strong benefits culture? I accept that your thesis that the benefits culture is too strong in the UK, but doubt that merely taking that away will be enough to solve problems that are more fundamental. Wow, you take what I am saying to then subverting it's meaning to support your agenda. Okay so not ALL work their up, lets extract the 0.5% filthy rich, which means 99.5% of workers start at the bottom be it in business or employment and then work their way up. Your again going off onto something else with regards your focus on immigration, when this article is about the rioters of which 99.9% are apparently British by birth. In fact I agree with your key points in that there should (IS) a points based system for legal immigration, and that illegal immigrants should be deported, held in detention and border controls should be enforced. Your asking why scandianian countries are prospering without an analysis of desperate reasons such as small populations with BIG oil industries for one, same could apply to many of the gulf states. And I am sure despite what you hear aof socialist scandinavian states at the heart of their success will lie free market capitalism in private and public sectors. Remember success breads over confidence just before they head for a big fall, recent history illustrates this with Ireland the celtic tiger for just one example. But it fails horribly when you have a contracting economy with a growing population of workers...I'm not sure if that describes the UK, but that is the USA. The USA outsourced its jobs and replaced the lost income with massive amounts of both public and private credit. The public credit has run dry and the only thing holding our faux economy together is government deficit spending;which is now waning. This is no easy/political solution to the global debt/outsourced away jobs/revenue economic problems; the final solution will be reality pushing the reset button and total washout of the system. You're right with your welfare state comments Nadeem, but there is no way to fix it right now. "fixing it" by telling people to get a job that doesn't exist is no solution...but it probably would get that reset button pushed a little faster...and that would be the time to reform the system. I have been an avid reader of your blog and MO for a couple of years but it does annoy me that you don't seem to have a . on your keyboard. Maybe I am being pedantic but it does distract from the content of your writing. The whole first paragraph in this piece is one sentance. Regarding the riots. I'm not sure how much austerity is to blame. Benefits haven't been cut and these people haven't lost their jobs because they mostly never had one. I'm not aware that the drug trade has suffered through the recession. The people who should be rioting are the middle classes but they won't because they have too much to lose. For the workshy underclass, rioting and theiving is the logical lifestyle choice. The fine for shoplifting is barely more than the fine for driving at 45 in a 40 mph zone or parking on a yellow line, and while working for a wage results in a cut to benefits, stealing does not. Dr Ray, spelling is an issue with me. Your first paragraph sentance is spelled with an "e" not an 'a'. The notion that a court punishment should be akin to a powerball game is ridiculous. The punishment should fit the crime and although it may seem some punishments are soft, there are always circumstances that we are rarely privy to, compared to judges who see cases day in and day out, making decisions about peoples freedom. Personally a welfare state is wrong, however the there needs to be something, because the streets would not be safe to walk, unless we had police with machine guns ready to use them if someone twitched the wrong way. People still need to eat, clothe themselves and have a roof over their head. Would you like England to be like Rio, where you can't safely walk the streets unless you look like bum or have security? As far as the Romans are concerned, their empire crumbled from the inside, just like all empires eventually do. Just a note of thanks for all your economic journalism over the years. I have always read your articles with interest, and tend to agree with a great deal you say. You are an excellent educator. Regarding sentencing: it looks like my suggestion, ridiculous as you find it, has been adopted by the courts. One chap has got 6 months for stealing a bottle of water from Lidl and the majority of the people who have appeared in court have been remanded in custody and look set to get custodial sentences. I await to see how many of these sentences are challanged in future as the courts seem to be carrying out the politicians instructions rather than acting independantly. i read your articles with great interest Nadeem So it is Really disappointing to hear this right wing claptrap. The benefit scroungers mantra is launched every recession to shield the government from criticism. There aren't the jobs. Someone has to be unemployed under this system, and the laws of the jungle mean it is the less able, less educated, less stable that fall by the wayside. Nadeem thank you for your valuable insights. Given we are close to the end of 2011 what do you think is the outlook for London residential property over the next 5 years? I will be taking an indepth look at housing before year end, it will be more accurate once Ive updated the inflation expectations so better to come after the forecast for inflation for 2012. Given the amount of work it will probably resolve in a short ebook (40 or so pages) before year end. Hi Nadeem - really appreciate your reply. I have only just found your site but am hoovering up your articles at a rate of knots. Great work sir! You and Kyle Bass are at the top of my "follow" list. Eagerly await you UK Housing analysis. I will go full throttle this month to get the analysis done, I estimate it will take me approx 40 hours of work to arrive at a probable trend conclusion. The reason Nadeem hasn't done an in-depth UK housing analysis in the last 12 months is because he is focused on the cash markets. "The Stealth Bull Market Mega Trend"